Aquaman is a fun time for every age group. If you can, see it in IMAX. By any definition, "Aquaman" is a certified Blockbuster, a mega-action superhero flick filled with spectacle, cool visuals, decadent insanity, and frenetic fun. It's quite probably the best film of the ‘comic book' Superhero genre brought to the screen so far. The scope of the eye candy here is breathtaking; from the clever underwater physics and the high-concept Underwater Cities to the funky sea-life transportation, from a bongo-playing octopus to the ever wet muscles of Jason Momoa. There's something unusual filling the screen every minute to keep you entertained. Such audacious, costly, and successful filmmaking is still a rare commodity. As an origins tale, "Aquaman" seems a little long at 2 ½ hours, but each time you begin to feel that way, it takes off again and you're into another wildly absurd, unexpected, and exciting adventure. Been a long time since even a "Bond" film has done that for an audience. Even the ending, as predictable as possible, will leave you satisfied. One dark stormy night, lighthouse keeper Thomas Curry (Morrison) rescues Atlanna (Kidman), a princess on the run from fabled Atlantis. 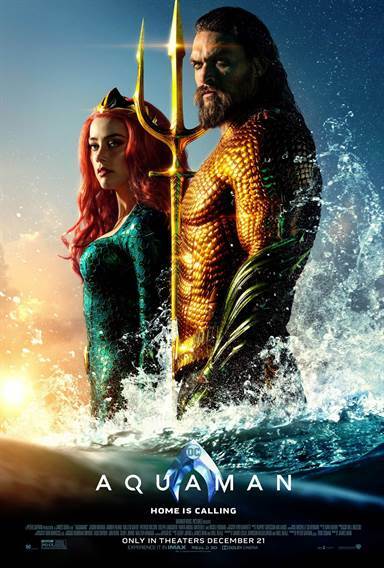 They fall in love and give birth to Arthur (Momoa) an illicit half-Human, half-Atlantean child with the ability to communicate with creatures of the sea. Atlanna is forced to abandon them and return to Atlantis to keep the boy safe, entrusting his welfare and education to her advisor Vulko (Dafoe). Years pass and Orm (Wilson), the new power-hungry King of Atlantis, has decided to consolidate his forces with the other underwater realms, and destroy the surface dwellers who are ruining the Oceans and threaten Atlantis' security. The only thing standing in his way is Arthur, secretly known as "Aquaman", who it turns out is Orm's half-brother and the rightful heir to the throne. The problem is, Arthur couldn't care less, until Princess Mera (Heard) shows up, sets him on a quest for the legendary trident of Atlan and eventually his destiny. This is definitely Momoa's film; it's an instant star turn. He's fun to watch, never taking himself seriously, and he carries the role "Aquaman" with ease and humor. Every other character in the film just seems like his support team. We just want to watch him do his thing, not them. Kidman is wonderful, but she's not in the film much. Heard is also good, but she's hampered with a role written generically. The other standout performance is by Abdul-Mateen II as Aquaman's nemesis Black Manta. My take… I liked the film. It's a fun time for every age group. If you can, see it in IMAX. Can a film with Momoa and "the Rock" be far away! I'd pay to see that.